Choo Choo! Pajama Jam @MVPublicLibrary and CAC CAC! Customer Acquisition Cost! Note the inclusion of analog AND digital storytelling tools; the inclusion of one does not entail the exclusion of the other. I was pretty sad tonight at Pajama Jam at the Mountain View Public Library; it’s the last session we have planned, though this has been another very successful set of storytimes. Many of the families who attended asked if we would please offer it again, but I didn’t have any dates to give them. I understand from the parent’s point of view; reliable, ongoing, drop-in programming is generally better for busy schedules. I also understand from the library’s point of view; budgets, space and staff time are in short supply and we do the best with what we can to serve the most people in our communities. There is the issue of audience size, too. A room full of 40, 75 or even 100 people, half of whom are approximately 2 years old, can be very difficult to manage for not only the facilitator, but the parents as well. Offering more regular, drop in programs would bring down the numbers in each of the programs, offer families options for times and days, but also brings back families who are scared away by large groups. The quality of the experience for the end user (the families) goes up, and they’re more likely to return, tell their friends, and acquire new customers for the library. The staff time you put into developing more programming is a long-term Customer Acquisition Cost (CAC). The kids you delight and inspire at storytime will develop fond memories of being at the library, their parents will be likely to bring their kids back, everybody will be more willing to vote for library supporting bond measures should they arise, and you achieve what *should* be your goal as a children’s librarian; to offer the highest quality services, collections and programs to the most people in the community you serve. 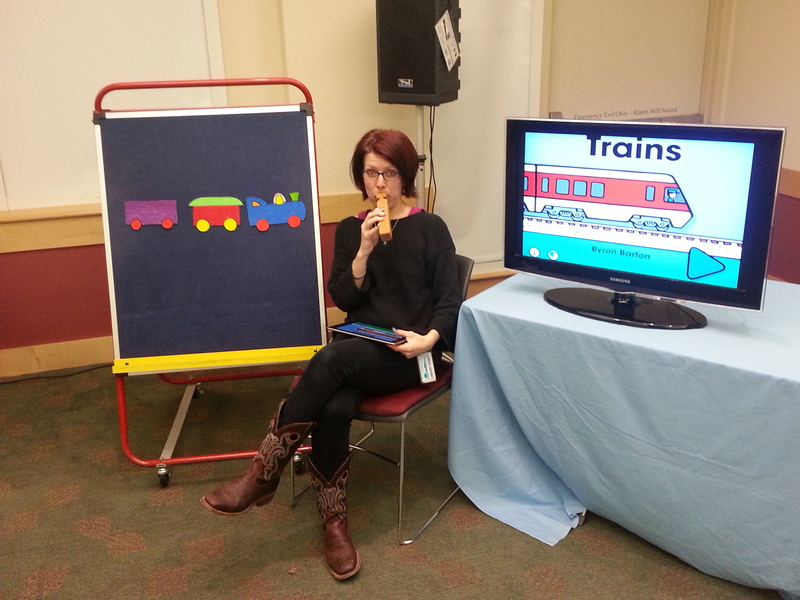 Tonight’s storytime was designed with the customer in mind: 2-5 year olds and their families (we had 40 people total). And what do 2-5 year olds and their families love? That’s right. Trains. Early literacy tip: Phonological awareness: smaller parts of language. Playing with sounds helps your child to figure out how sounds work together in the language you speak with them. Posted on March 12, 2013, in Apps, Story Time and tagged MVPL, Pajama Jam. Bookmark the permalink. Leave a comment.